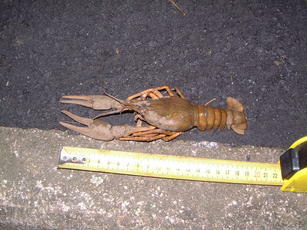 Turkish Crayfish are also known as Turkish Narrow-clawed Crayfish and are usually about 15 cm long but can be up to 30 cm. Pale yellow to pale green in colour. Sides of carapace very rough. Two pairs of ridges behind the eye sockets. Rostrum well developed with parallel sides and long apex. Claws: Long and narrow, upper surface rough, underside same colour as body. Prefers still waters as in lakes and canals, occasionally found in rivers. More aggressive and faster breeding than our native White-clawed crayfish. Turkish Crayfish have been imported into Britain for the restaurant trade since the 1970s. However, some crayfish have escaped or been deliberately introduced into the wild where large, rapidly expanding populations now exist in some places, with the most successful populations confined to parts of south-east England and reaching as far north as the Midlands. Turkish Crayfish are tolerant of saline. The species has reached Leicestershire & Rutland and numbers are probably increasing in our area.